The weather in the Phoenix area has been good. Well, mostly it has been good. We’ve had the normal blue skies and gorgeous sunshine. Plus we’ve also had clouds and some rain drops. To complain about any of it isn’t something I’m going to do right now. After all I’ve seen loads of pictures of snow elsewhere. Besides that regardless of the weather, we most certainly haven’t had much of a chance to be out in it. We’ve been pretty busy. Terry’s mother had her surgery on Friday. It took most of the day. The cancer had spread more than the doctors had thought it had. She was in and out of surgery four times that day to “get a little more” . Then, she had to return for additional surgery on Monday. Terry’s been spending most nights over at her place. Last night he finally got to sleep in his own bed and we think the staying over there is behind him. His mother has had a few rough days but everything is uphill from here we hope. His brother, sister, aunt and uncle all hang out at her place during the day. Believe me when I say, it’s one heck of a lot of people for one heck of a long time. It’s certainly been stressful at times. We’ve become pretty experienced over the last couple of years sitting with ill relatives. It's not been fun for them or fun for us but it’s what family does. We want to be there with them even if they may not know we’re there. Recently bloggers, Georgie and Suzie had to head back to Canada to help with their aging parents. Today we met with friends, Tina and Jeff, who are on their way to Denver for the same reason. 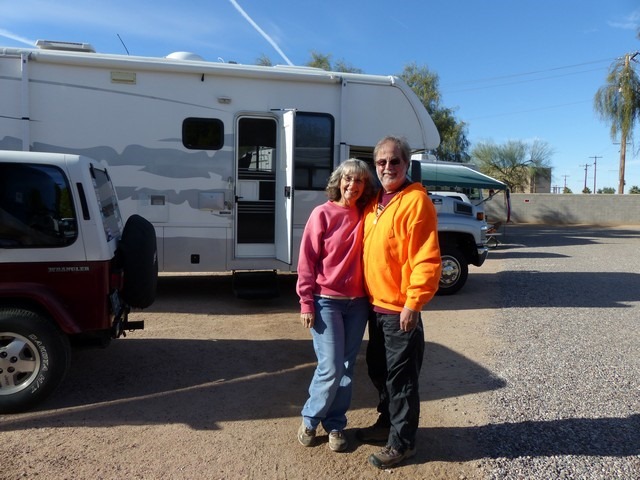 They left their RV in Quartzsite with friends and parked their Jeep in our site. Even though we’ll be heading to Quartzsite next week, we’re still paying for our site so their Jeep will be here when they return. We took Tina and Jeff to the Phoenix airport this morning. If we’re not here when they return, it’s just a short taxi ride back to get their vehicle. This Elks RV Park is full, full, full. Every site is full including the overflow area on the side. You can tell the folks who just arrived from the cold north. They sit outside in their little camp chairs while they soak up as much of the sun as they can. Can you blame them? People are everywhere. The other night Terry and I went into the lodge to order some appetizers and unwind a tad after a full day with his family. Had we not ordered the appetizers, we probably would have left. Two RVing couples were sitting at another table and obviously had started their own little party before heading to the lodge. We were reminded how not to act in public. Thank goodness they didn’t have to drive home. That’s about it for now. It looks like we’ll be heading to Quartzsite next week. I'm thinking we’ll feel like we’re on vacation! Normally Terry’s not thrilled about boondocking adventures but this time, he’s really ready for the break. See you at Blogger-Fest. Coordinates will be posted about the 21st or 22nd. Family – like branches of a tree, we all grow in different directions, yet our roots remain as One. Good luck with things there, a lots pictures from Quartzsite would be real nice, we sgould have been there for a week already, but.... like you said life happens. Blog fest should be wonderful too! That is good news about mom and her uphill recovery. See you at the Q. It is good news about Terry's Mom - and I'm thrilled that you guys are going to be able to make it to Q. You know you're busy when Q in January is a break from people.....glad Mom's healing and has a variety of family near her. Enjoy that sunshine! Somehow I had no idea that you are in the Phoenix area too. How's that for being wrapped up in my own world? We are in Mesa, headed to Q tomorrow, but let us know if you need anything.